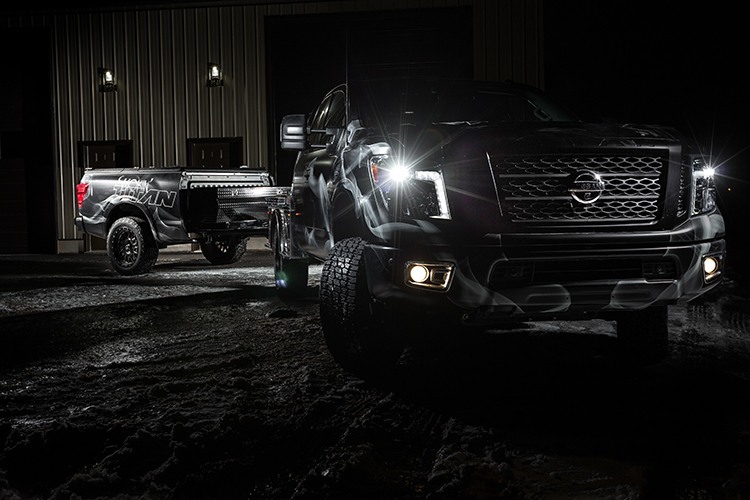 INDIANAPOLIS – Taking barbeque to another level, Nissan is debuting the world’s first fully integrated in-truck-bed smoker and mobile kitchen – a specially modified 2018 TITAN XD Gas King Cab dubbed “Smokin’ TITAN.” Designed as a dream project vehicle for tailgating and barbecuing enthusiasts, Smokin’ TITAN features a custom flatbed with a built-in Lang BBQ smoker and an abundance of chef-friendly features. The truck will be on display this weekend at the 2018 Work Truck Show, the largest work truck event in North America. The project truck started as a stock TITAN XD Gas King Cab – straight from the Canton, Mississippi, factory floor. The transformation to Smokin’ TITAN began with the addition of a custom CM Truck Beds aluminum flatbed – allowing space for three food prep stations each featuring a Partner Steel aluminum double burner prep stove alongside a Churrasco Brazilian Wood cutting board. A Teton Steel custom on-board 24x24 sink and water storage system is accessible with an easy step up from the flatbed. The self-contained sink and water system also can be interchanged with a Yeti Cooler when cold storage is more the priority. Utilizing TITAN’s flat load floor in the second row of the King Cab, an ARB 50-qt. Fridge Freezer and Slide was added to the backseat along with a custom built spice rack. The heart of Smokin’ TITAN lies inside the custom trailer behind the truck. 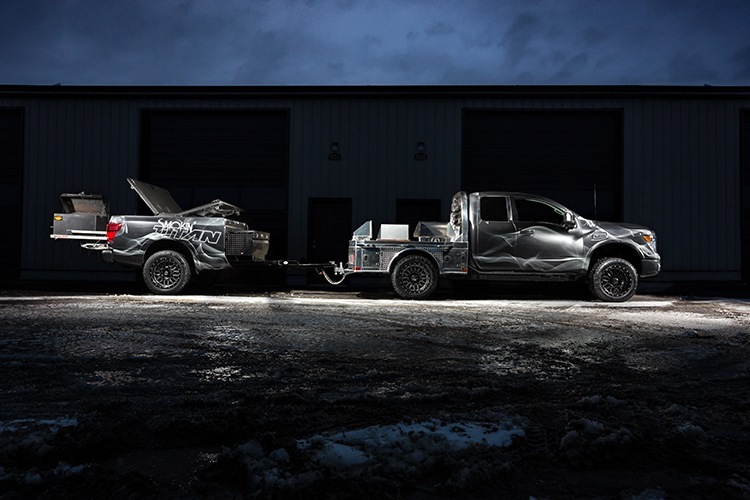 Since food smoking can create heat up to 600 degrees, the TITAN XD’s factory bed was removed from the truck and put on a B&S Custom trailer to prevent that heat from affecting the truck. 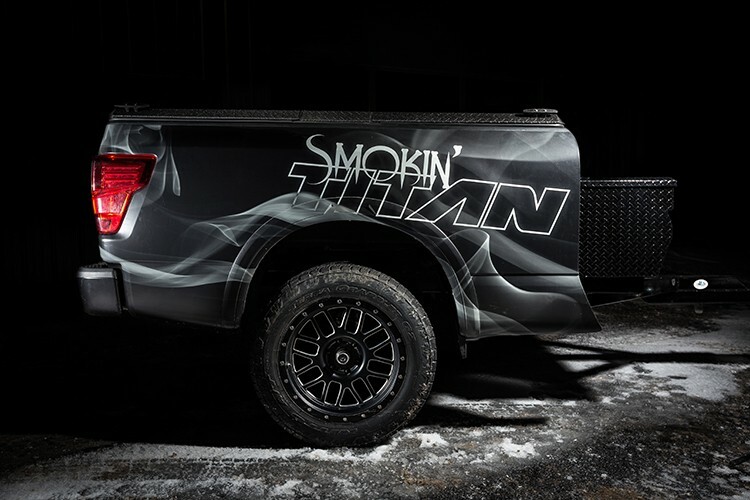 The Smokin’ TITAN bed-trailer features two Nissan TITAN Boxes as lockable dry storage for the smoker pellets and wood chips flanking the smoker. Utilizing the TITAN’s innovative Utili-Track System, a B&S Customizing sliding tray was designed to easily slide the smoker in and out of the bed, supporting the custom Lang BBQ Smoker and Char Grill. When the smoker is not in use, the whole trailer is secured with a steel Diamondback SE Tonneau cover, allowing the user to smoke meat at a tailgate and pack it up for the trip home. “This truck has everything you need for a tailgate barbeque, including the kitchen sink!” said Hayes. While the TITAN XD Gas King Cab presents a powerful presence in factory form, Smokin’ TITAN spices things up with a leveling kit and an IF Signs Custom Flame wrap. In addition, the truck features 20-inch ICON Alloy Alpha wheels, and 275/25-20 Nitto Terra Grappler tires. All told, Smokin’ TITAN showcases 20 unique aftermarket parts and accessories from leading manufacturers in the grilling, kitchenware and trucking industries. 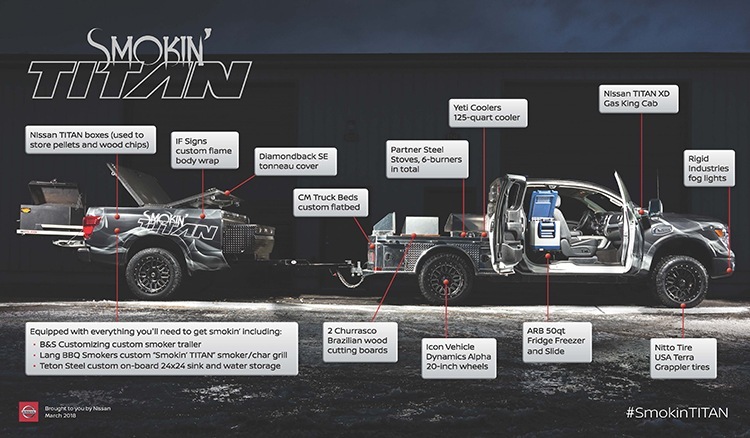 The Nissan Smokin’ TITAN will be making additional appearances this spring and summer at outdoor adventure shows and exhibitions. A full list of Smokin’ TITAN accessories and suppliers can be found here. For more information on the complete 2018 Nissan vehicle lineup, please visit www.nissannews.com.